This is the third in a series of stories about investments in Detroit good food enterprises that are working to increase access to affordable, healthy food in low-income and underserved communities. Back when Monique Dooley was a teacher, she noticed the connection between what students ate and how they felt and behaved. “The kid’s energy levels changed, and the way they behaved changed, and I was really intrigued by that,” she says. That realization stuck with her. So when she left teaching in 2013, it made perfect sense for her to create a business that’s all about health. 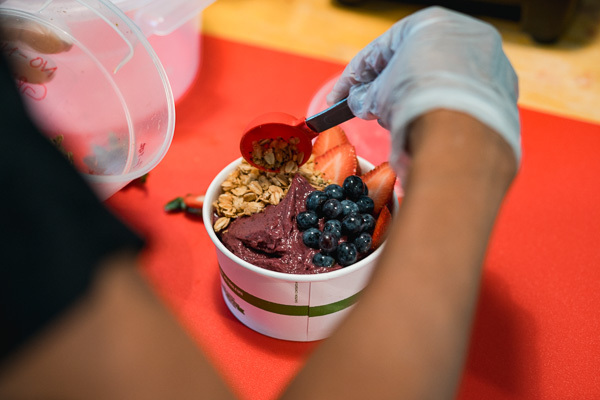 Now you can see Dooley behind the counter of Fresh101 Superfood Café, a juice bar she recently opened, greeting customers with a broad smile and information about the cold-pressed juices, smoothies, and soups on the menu. 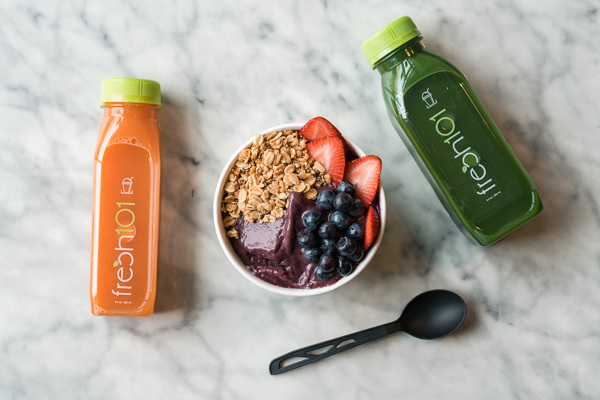 The new café, which occupies a small, modern space at Canfield Street and Cass Avenue, fills a niche in Midtown, where a juice bar fits in happily among yoga studios, hipster boutiques, bookstores, and the Wayne State University campus. Dooley says that area residents, Midtown Detroit, Inc., and other business owners had been looking for a juice bar to open in the neighborhood. The cafe is also in step with the city of Detroit’s movement toward 20-minute neighborhoods, a concept where residents can walk or bike to shopping, food, and recreation in 20 minutes or less. “We just fit with this location because I think there’s a passion and there’s a growing interest in being healthy,” says Dooley. Dooley wants to make sure that the healthy, whole foods Fresh101 offers are affordable for everyone living, working in, and visiting the neighborhood—even those with less money in their pockets. Most eight-ounce drinks are $5 and 12-ounce drinks are $7. Students and DMC employees receive a discount. Dooley uses whole, organic foods, and all offerings are dairy free. She sources locally when she can and plans to collaborate more with local farmers when growing season begins. She started Fresh101 as a mobile operation in 2016. With a $35,000 loan from the Michigan Good Food Fund through Northern Initiatives, she was able to build out her current storefront space and open her doors in January this year. Capital Impact Partners, the fund manager for the MGFF, is the primary lender for loans of more than $250,000 and coordinates a network of intermediary lenders, including Northern Initiatives, to facilitate smaller loan amounts. Fresh101, and other good food investments around the state, including the manufacturing facility FEAST Detroit, is just the kind of business MGFF was meant to support. According to Mary Donnell, Capital Impact Partners’ project manager for the MGFF, Fresh101 aligns with the fund’s mission-driven criteria on multiple fronts: it offers healthy food products at affordable prices; uses whole fruits and vegetables and, when possible, sources from local growers; and has potential to create jobs as it grows, with a commitment to hire from the community. MGFF was also attracted to Dooley’s creative collaboration with Detroit’s Recovery Park (DRP), a support and recovery management center for people working to establish a drug-free life. Fresh101 has offered juice at DRP women’s conferences and served products at recovery meetings at both the eastside and westside locations. Plans are in the works for a Fresh101 satellite location at DRP, where Dooley will train someone from the program to staff. The items will also be sold at a lower price. For Dooley, the juice business and reaching out to vulnerable populations like those in recovery feels like a natural transition from her background in education. Dooley used the classroom to teach young children how to choose good foods and the importance of whole foods, and worked with the Detroit Public School system to reduce the amount of sugary foods they consumed. Dooley sees her current business as a stepping stone to “getting back to the kids,” and hopes to introduce programming for schools some day. First posted on Model D 26 March, 2018.